BROOKLYN, N.Y.--(BUSINESS WIRE)--West Elm, a purpose-driven furnishings retail brand, has introduced the West Elm Pinterest Style Finder, a new online tool utilizing artificial intelligence to help customers transition style inspiration into products they can buy at West Elm stores and online. The new tool is an extension of Style + Service, the brand’s design consultation program offering customers design, installation and registry services at each of its 100 stores across the U.S., Australia, Canada and the U.K. West Elm is one of the first home brands to utilize image recognition technology to analyze Pinterest Boards to determine a user’s personal style at home. 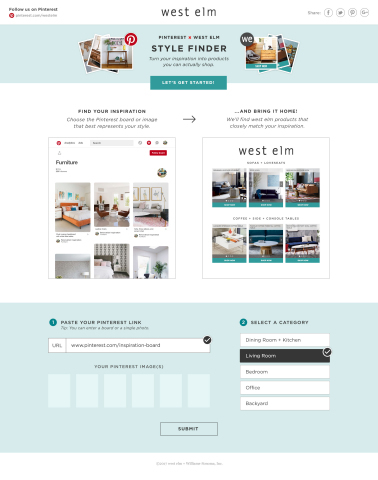 The West Elm Pinterest Style Finder is powered by Clarifai’s image and video recognition AI Technology. Clarifai is a market leader in visual recognition, and its powerful image and video recognition technology is built on the most advanced machine learning systems. The Style Finder tool utilizes images from a Pinterest board, either a user’s own board or someone else’s, to recognize a user’s style and color preferences from the collected array of images. The style finder then filters products from West Elm’s online catalog of nearly 5,000 products, suggesting three options from each product category, including furniture, rugs, curtains, mirrors, decorative accessories and more, that are surfaced in order to offer customers choice and variety. The West Elm Pinterest Style Finder is unique to West Elm, and is representative of how West Elm and the Williams-Sonoma, Inc. portfolio of brands are experimenting with new technology to enhance our customer’s experience across all channels. To get started, visit the West Elm Pinterest Style Finder page https://pinterest-style-finder.westelm.com/ to upload photos from your Pinterest board. Headquartered in Brooklyn, NY since 2002, West Elm opened its first store in DUMBO, the neighborhood it still proudly calls home. With a mission of harnessing the power of design and human connection to enrich lives, everything West Elm does is designed to make an impact in everyday life, from creating unique, affordable designs for modern living and commitment to Fair Trade Certified, from LOCAL and handcrafted products to community-driven collaborations and events. The brand operates 100 retail stores in the United States, Australia, Canada and the UK, ships internationally to customers around the world and operates stores in Mexico, the Middle East and Philippines through unaffiliated franchisees. In addition to home furnishings retail, West Elm operates West Elm Workspace in the commercial furnishings industry and announced its expansion into the travel and hospitality industry with the launch of West Elm Hotels. West Elm publishes the blog Front+Main and is part of an active community on Facebook, Instagram, Pinterest, Twitter and YouTube. West Elm is a member of the Williams-Sonoma, Inc. portfolio of brands. Clarifai is an artificial intelligence company that excels in visual recognition, solving real-world problems for businesses and developers alike. Founded in 2013 by Matthew Zeiler, a foremost expert in machine learning, Clarifai has been a market leader since winning the top five places in image classification at the ImageNet 2013 competition, and predicts more than 1.4 billion concepts in photos and videos every month. Clarifai’s powerful image and video recognition technology is built on the most advanced machine learning systems and made easily accessible by a clean API, empowering developers all over the world to build a new generation of intelligent applications. The company has amassed a suite of clients that range from Fortune 500 companies to startups and small development teams, including Buzzfeed, Trivago, 500px, StyleMePretty, and many more. Clarifai is headquartered in New York City with an office in San Francisco.